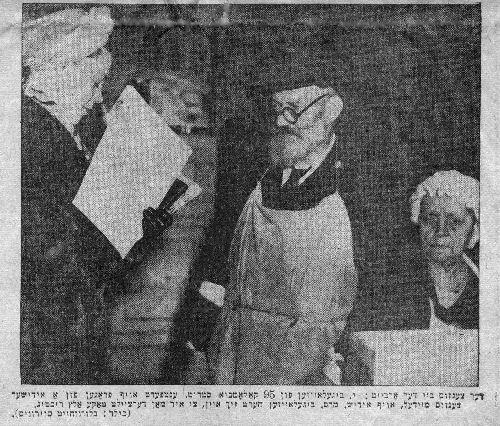 source: Yiddish daily, "Der Tog"
" The Census at the workplace: J. Biegeleisen of 95 Columbia Street, answers questions from a Jewish Census girl (a 'maydl') in Yiddish. Mrs. Biegeleisen listens in to make certain that her husband answers correctly." My grandparents Jacob and Scheindel Biegeleisen were from the town of Mielec in Galicia, Poland. In the United States, they were in the feather business. Their store was located at 95 Columbia Street in lower Manhattan. Scheindel was also in the poultry business as a side enterprise. She would purchase a small number of chickens at the Jewish Market on Delancy Street (beneath the Williamsburg Bridge), have them slaughtered, pluck their feathers and sell them to neighborhood customers, after she had cleaned and butchered them. A few birds were for her and her family's use. The feather business had nothing whatsoever to do with the chickens-- my grandparents would sort "raw" feathers of various kinds into cardboard boxes placed around a white, metal-topped table. Varieties of down, fancy feathers, etc. would then be sold to middle-men who would, in turn, sell them to hatters, clothiers, pillow and blanket-makers and others. Their store was a gathering place for family and friends, neighbors and people from the "Old Country". Both of them wore white aprons when they worked. The store had an overhead scale and a commercial scale to weigh the large bags of sorted feathers. The bags were transported in my-forever complaining-uncle's roomy taxicab. In their store there was a large wood-burning stove, a butcher block which showed years of use, a row of different chairs for visitors to sit on, and several tough-looking cats who were permanent fixtures there. These were no-nonsense animals who would do battle with the rats in the dark and mysterious back room and bore the scars of battle and seldom lost.